Jump to the main post. 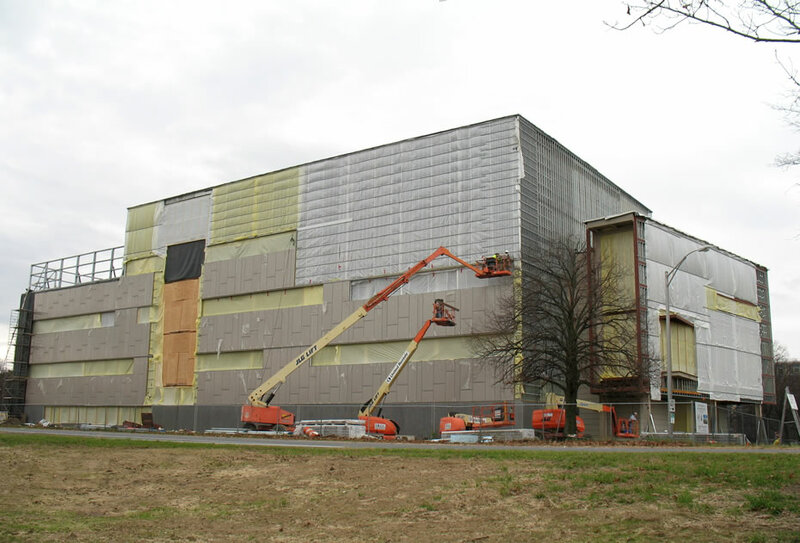 Someone asked us the other day (in person, yes, very old fashioned) if we knew what was up with that building going up on the edge of the Harriman State Office Campus along Washington Ave in Albany. Our answer was along the lines of "It's a state lab something or other..."
Yeah, so we needed to get more details. And here they are, with photos even. 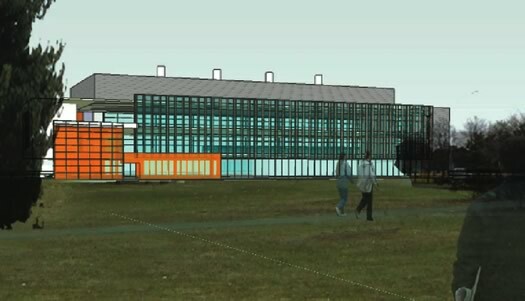 The 70,000 square foot, three-story laboratory, which will be designed and constructed by the State Office of General Services, will be located approximately 100 yards from the existing laboratory which is now housed in Building 7 on the State Office Campus. New state-of-the-art testing instrumentation and biological and chemical containment systems will be installed in the new lab to enhance its current food safety and agricultural product testing programs. Large-format photos of the building, as of end the November, are at the top of this post -- scroll all the way up to see them. We checked with the state Office of General Services, which is overseeing the construction, about the building this week. 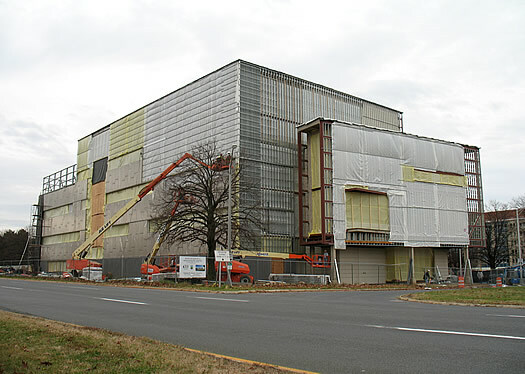 A spokesperson says the building is scheduled to be finished in November 2012. So, what do these labs do? We're confident that you know exactly what "metrology" is -- but, you know, just in case a friend asks: metrology is the science of measurement. The State Metrology Lab "maintains the State Standards of mass, volume, length, and temperature" and offers calibration services to public and private orgs. In other words, they help people make sure instruments being used to make measurements are accurate. The lab is part of the state Bureau of Weights and Measures. Also this past October, the TU reported that a plan had been floated to build a new Albany high school on the Harriman campus, according to "several people familiar with the proposal who are not authorized to speak about it publicly." But there's hasn't been anything since that. 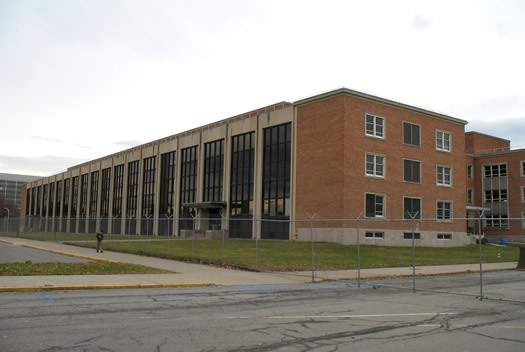 The spokesperson for OGS we contacted this week about the Department of Agriculture lab said there's nothing new to report on overall development plans for the Harriman campus. Earlier on AOA: What's up at Washington and Fuller? While you are solving local mysteries, can you find out what's up with all the ominous shrouded machines that have appeared in downtown? They look to be some type of parking hassle-ometers. Did the city outsource/privatize the parking? oh NOW I get it. totally makes sense to have new construction when an empty building sits on the same parcel of land. If it was Opposite Day. Made me happy to watch the construction. They used Schenectady Steel, proudly printed on the beams. Go Local! I think I was the one who asked about building 1. Thanks for the update. The campus is a great place to walk my dog and that building makes me so sad when we're in the area. Structurally it looks solid (and not even as dated as some of the other buildings). I just read the sections of the 2030 plan having to do with the Harriman campus (since it might effect those dog walks). Looks like all of the buildings may be at risk. There is talk about office, retail and some housing (although only rental and condo type places, blech, don't we have enough of those cruddy places?). I think the key piece that the neighbors in Eagle Hill will fight is the street connections to the campus...right now the neighborhood has a number of quiet, dead end streets that would become busy short cuts to Western Ave if I'm interpreting the plan correctly. I will say, overall I am a excited by the 2030 plan. It's nice to know that people are thinking about Albany's future...we have so much potential. I just hope it is executed without the typical Albany pork. 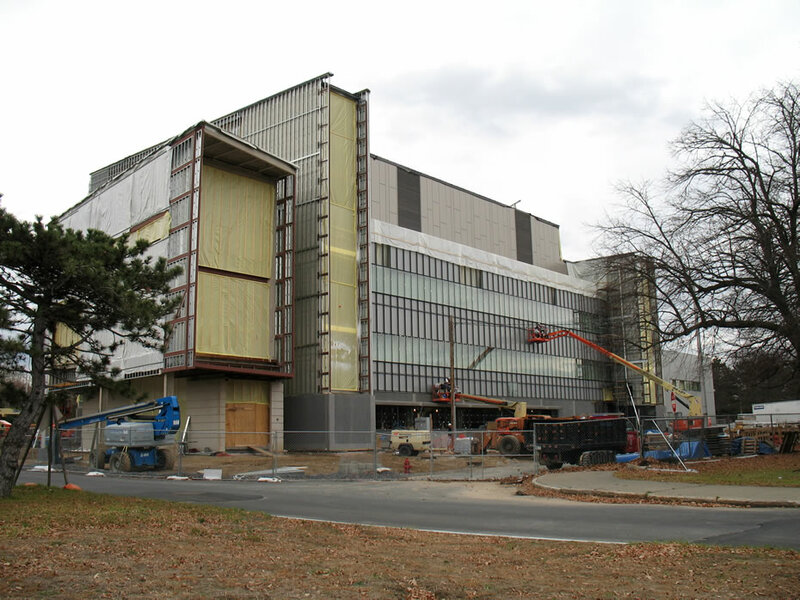 @Rebecca - If it was any other kind of building you'd be completely right and this would be a colossal waste, but retro-fitting a non-lab building to be a lab (or medical space) is more expensive than building a new lab building from scratch. There's a lot of weird plumbing and electric and floor reinforcement and refrigeration, etc. I do find it strange that they built it so close to the road, but it was probably the only option that wouldn't eliminate parking. "overall I am a excited by the 2030 plan"
Did the 2030 plan mention anything about downtown parking permits being implemented? The way things are going it doesn't seem like that will happen by 2030. More road connections actually reduces traffic on main arteries, and reduces accidents. It's one of many problems with the way that suburban roads operate. I think they are updating the parking meter system. Replacing the old meters with new machines (used widely in other cities) so that people can pay by cash/credit/change. I could be wrong on that but that's what it looks like to me. Code Monkey, Lauren has it on the nose, you can see some of the new meters in use on State Street. Put the intro to Cool Hand Luke in the category "things your children won't understand", along with rotary phones and CDs. "Code Monkey, Lauren has it on the nose, you can see some of the new meters in use on State Street." Right. But who paid for them? That is a pretty big investment for a city that is broke that had perfectly good parking meters. Building 1 used to be the Department of Civil Service. My understanding is, in 2002 or 2003 DCS began planning the move that would take place when the AESOB rehabbing finished in '06, after Pataki made the announcement to turn the campus into a tech park (which, as you know, never happened, for a variety of reasons). DCS was one of the agencies targeted to move first, because, apparently, there was a significant amount of asbestos in the building. After everyone had been moved the demo crews went in to demo the building, then they decided that it wouldn't be as much as they thought to rehab the building and rid it of asbestos. So they put up a fence around it and used the lot for overflow parking. Except, the rehabs never happened, and it still sits vacant. Even still, I don't think it is prudent to move people in there given the (supposed?) asbestos levels - that should be remediated first. Furthermore, there might be a lot of retrofitting involved with using that building as opposed to building a new lab that can use new technologies, etc. It very well may be more cost-effective to build a new building depending on the needs. Code Monkey, I don't know the exact stats, but it I guess the idea is to reduce overall costs for meter management. Haven't you ever seen the guys walking up and down every street in downtown emptying the individual coinfed meters? They have to be paid a salary, you know. The aesthetics are nice, too, I think it's worth some money to have a city that looks decent (yeah, we have a way to go on that). If you want to question something, question the new streetlamps installed at each end of State downtown. I know you don't know the facts. And neither do I in this instance. However, since this city is in financial trouble, we should want the facts instead of just assuming the best. I don't think parking meters are one of the defining things that make a city look decent but if you do, then great. I believe the massive streetlights on State Street are from state money given to BBL because they were going to build a new office building where the wellington had been. No office building but no one every holds BBL responsible for anything since they own the Mayor and the County Executive. Sadly, if you don't want the answers to simple questions about how much things cost and how we can afford them, the politicians will just keep robbing you blind. And if we want a city that looks nice, we need politicians who aren't just lining their own pockets.